In Ancient Rome there were female gladiators, it was not common and at one point they tried to outlaw the practice, so it was rare. I saw this “gladiator” between the Colosseum and the ruins of the old gladiatorial school. A rare sight indeed! Female gladiators were not necessarily slaves or women who needed money; some were members of the wealthy class who took up the profession for fame and excitement. Remember the ancient gladiators were a combination of today’s rock stars and top athletes. 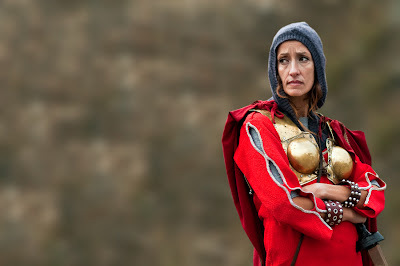 The other image this scene conjured up for me was Boudicca of Iceni (also knowns as Boadicea) who fought the Romans in Britain on some of the Essex fields where I played as a child. Her partner, King Prasutagus, was allowed to retain his crown under Roman rule but when he died the crown passed to Boudicca. The Romans were not to keen on women rulers so they beat Boadicea and raped her daughters. Well that annoyed just about everyone so it was not long before Boudicca and her daughters were leading a very angry rebel army of around 230,000 in a war that lasted two years and very nearly defeated Rome. Boudicca lost in the end - but back home (England) we still sing songs and tell stories about her - a true British hero! So it is strange how this picture that took less than a 2000th part of a second to capture evoked memories that go back almost 2000 years!